Hi! I'm Barney! 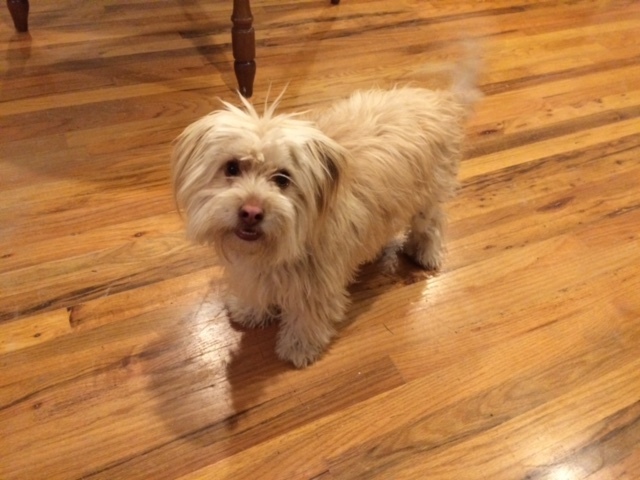 I'm about 3 years old, up to date on my doggie shots, neutered, and about 10 lbs. of total cute-iosity and snuggliness! People tell me I'm a terrier mix, and that makes me extra cute. My family adopted me from an animal shelter way up in the mountains, and I was really happy to have a real, stable and loving home. I love the kids I live with and I especially LOVE other dogs! But sometimes because I'm such a little guy, strangers can make me feel scared until I get to know them. After all, I'm so small in comparison with the rest of the world that I try to make a lot of noise with my barking just so they know not to step on me. But once they pay attention to me and give me lovies, I'm famous for warming up to them and even curling up on their laps! After all, I just want to be cuddled and safe! And hey --- I even got to participate in a prison training program, so I'm a socially conscious kinda guy. That program helped me work through some of my little guy fears, and now I feel a lot more confident around strangers. My family is going through some stress right now, so they're looking for a new home for me where I can have some stability, maybe with no kids or just older kids, and some extra training to help me be even more confident around big people!